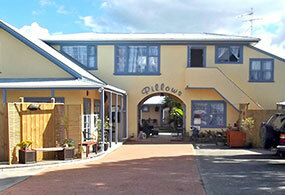 Pillows Lodge is conveniently located near the heart of Orewa, close to the town centre’s cafe’s and shops. Beautiful Orewa beach is just across the road for swimming, surfing or walking. We are within minutes of the famous Waiwera Thermal Pools, Gulf Harbour, three separate world class golf courses and the indoor all-year-round Snow Planet, also go-carting, horse riding, bush walks. There are so many fun things to do. Whether you are a backpacker looking for holiday accommodation or just on holiday and want an affordable en-suited room, Pillows Lodge answers all your needs. We are just a stones-throw from the beach and have large en-suited rooms with double beds and bunks for the kids through to the shared dorm facilities for the backpackers or tourist travellers. © 2013 Orewa Pillows Lodge Ltd.